This is Hailey. She is a service dog of a very dear friend of mine. I have wanted to paint her for some time. Her owner was kind enough to send me multiple images of her to be able to pull this off. I was intrigued by her skeletal structure and her dignified expression. I have to admit that I had to use my piece of acrylic with the crosshairs drawn on them to get her long nose right. I kept wanting to shorten the nose on the initial attempts at drawing her. You can find out more about that drawing technique here. I drew her with the use of the piece of acrylic with crosshairs, mentioned above. 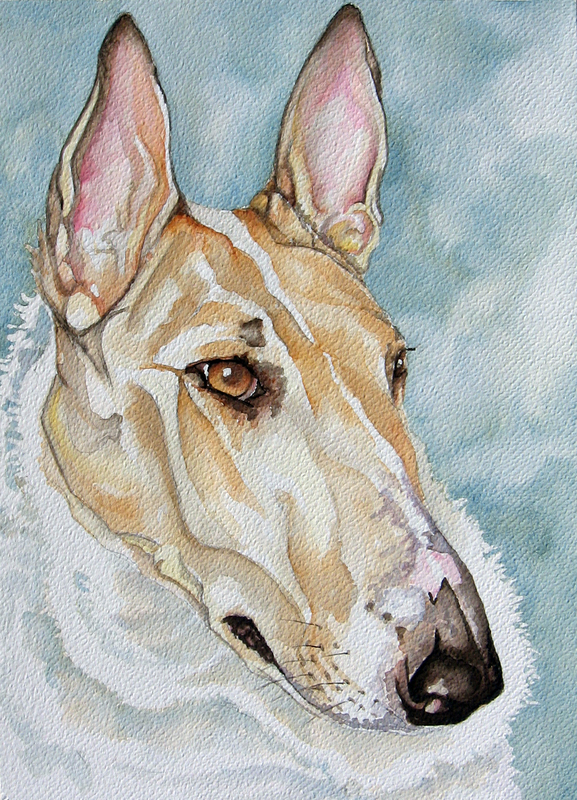 I payed careful attention to the linear forms of shadow throughout her face and ears. I knew I would need those lines, carefully placed, in order to render her contours and form accurately. This was the longest stage of the painting for me. I worked very slowly. I used small round brushes with very light washes and worked from very light to dark. She is so lightly colored and I did not want to “botch it” and have to begin over. The smallest brush I used was a #1 round. The largest was a #8 round. I applied liquid frisket on the highlight areas on her nose and eyes and some on that thin strip of a blaze on the bridge of her nose. I chose raw sienna, naples yellow, sepia, some burnt sienna, permanent rose, and blue stone as my colors. I made the grays with mixtures of blue stone, permanent rose and a raw sienna. The raw sienna and permanent rose were very watered down as they were added to the blue stone. Prior to finishing the details in a painting, I usually work in the background. I know the addition of a darker background will lighten the appearance of the colors in the subject. This gives me an opportunity to go back into the portrait and darken what I need to and refine the details. Prior to washing in the background, I frisketed Hailey’s ruff around her neck, so the texture of her hair will show up in the finished portrait. I then worked blue stone washes around Hailey’s head and into the shadows of her ruff with a #12 round. I find areas within the positive shape to include the background color so the painting looks more balanced and not like a cut out of a dog pasted on a background. The whole time I work my washes, I make choices about what edges I will leave hard and take the time to soften all the others with a damp or thirsty brush. The above step is what I call finishing and balancing. I went back into some of the yellows and darkened some of the forms and enhanced some of the contours with lightened or watered down sepia. 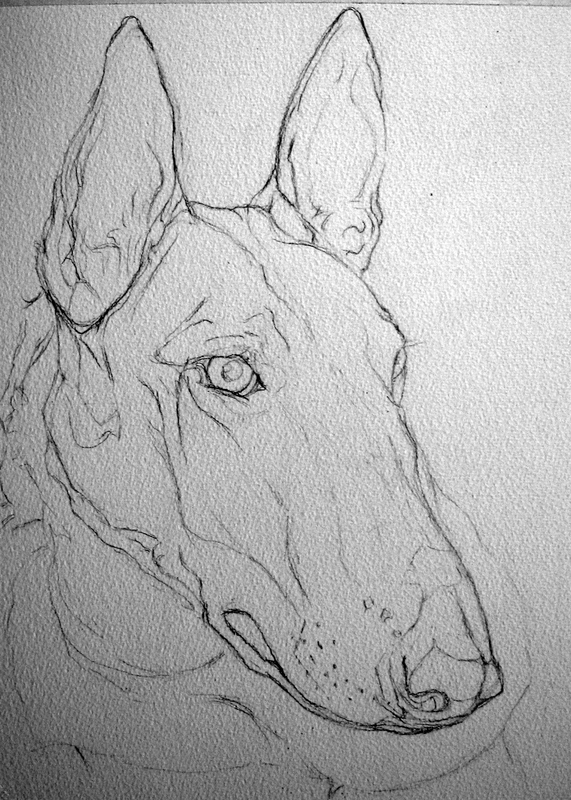 I detailed the grays around the muzzle and defined the shadows around her ruff. While the frisket was still on, I darkened and detailed the nose and went back into the eye and darkened it and detailed the pigment of the lids. I darkened her lips, freckles and the dots for the whiskers. I removed the frisket around the eyes and nose and washed light color into some of them so they did not appear so dark. Notice difference of highlights on the nose and the highlight in the eyes. I darkened the tips and dark line around the ears. 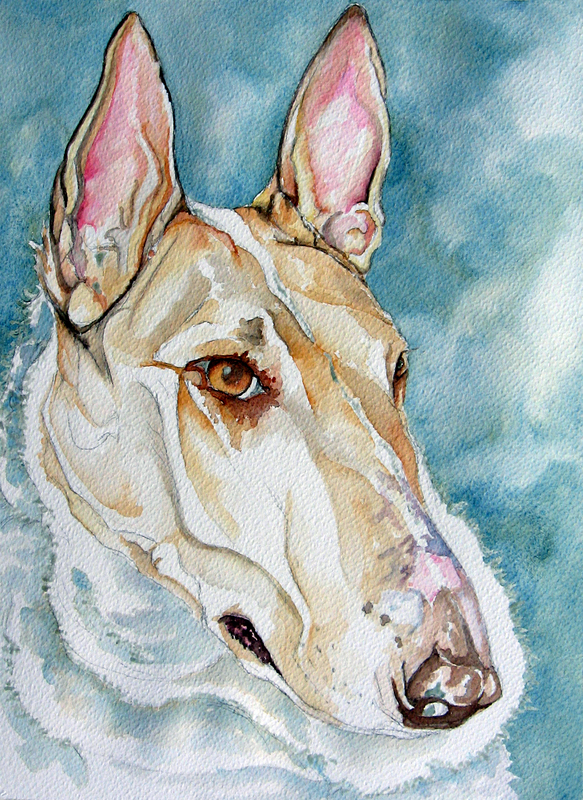 I softened the pinks in the ears with very light washes of sepia. I then removed the frisket on the ruff. I did not have to go back into that area to soften the edges. Sometimes I do have to do that. The last thing I did was add the whiskers with sepia and a small rigger. I hope, by including my steps, there might be something you can use in your own portrait attempts. 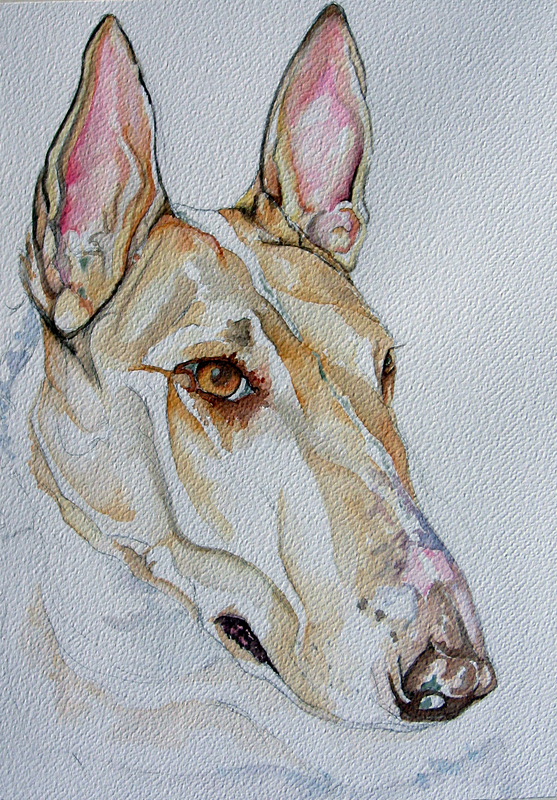 A heartfelt thankyou to my friend for sharing this beautiful dog with me so I could paint her. I had a blast creating this scene from a photo reference I found in a book of landscape photo references for artists. I wish I had taken time to snap pictures of the step by step for this one for all of you. I was very intrigued with the bright springlike colors of the moss hanging on the foreground tree and was able to capture that look somewhat close to how it looked in the photo. I liked the stretch of the farm lane leading back to the dense woods in the background. The sight was so peaceful, I just had to try it. I worked in large washes as I layed in the value transitions from foreground to background. The only thing I drew was the foreground tree. 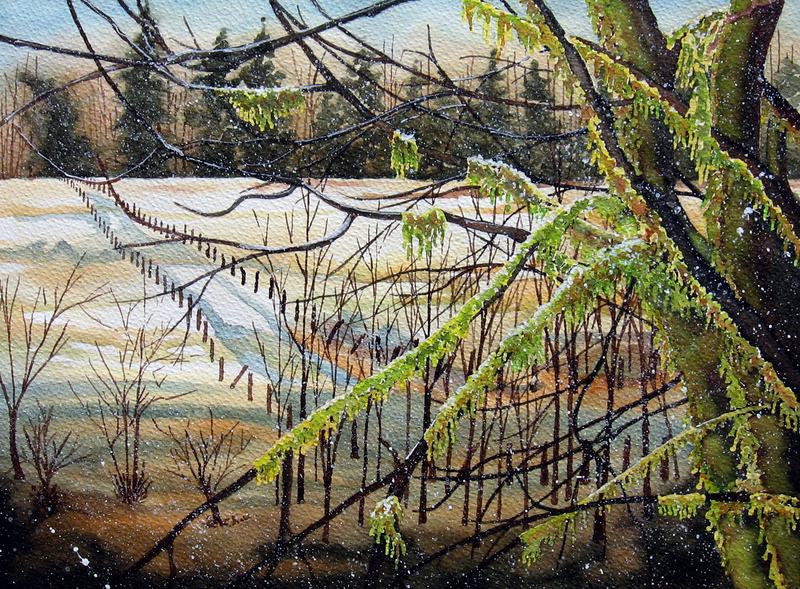 All the fenceposts, background forest, and small foreground trees were drybrushed in. I frisketed the hanging portions of the moss and went to town on drybrushing the little trees with a rigger and the foreground tree with a small round. Then I removed the frisket and greened in the moss and scumbled blurs of greens and raw sienna in the tree trunk and larger support branches. I stroked some white goache along the foreground tree’s large branches and dotted it on the top bumps of moss. I drybrushed the old fence posts along the lane and splattered the whole thing with a number two round brush, loaded with white acrylic, and declared it a SNOW DAY (something my kids always looked forward to!). Hope everyone is enjoying winter!